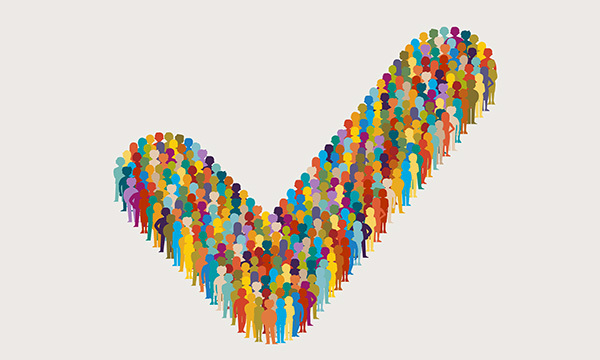 The Commons health committee publishes a review of the nursing workforce, which highlights pressures that are contributing to the shortfall of nurses, such as workload, pay, morale and lack of access to continuing professional development. 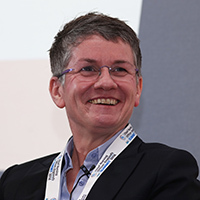 Nurses recognised in the Queen’s new year’s honours list include NHS England director of nursing Hilary Garratt, who is made a CBE. In its written evidence to inform the Agenda for Change pay deal, the government promises to help tackle staff shortages by ending the 1% nursing pay cap. 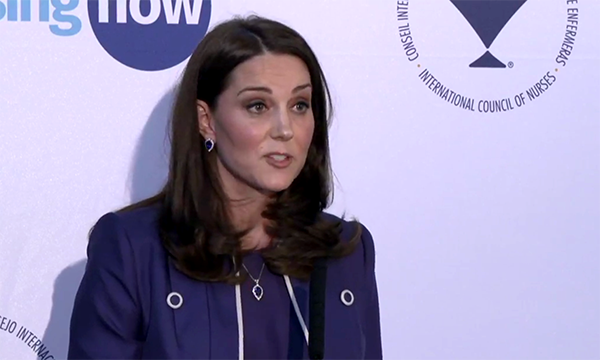 High-profile patron the Duchess of Cambridge helps launch the Nursing Now campaign. call for better NHS funding. 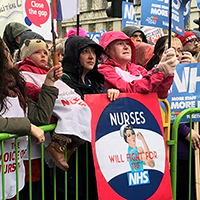 In London, 60,000 protesters, including many nurses, descend on Downing Street to call for better funding for the NHS, while simultaneous protests take place around the UK. New figures show the number of applicants for UK nursing degree programmes fell by 10% in 2017, leading the RCN to call for an urgent campaign to boost student numbers. The government announces that bursaries for preregistration postgraduate nursing students will end in summer 2018, an unpopular decision that mirrors the existing situation for undergraduate nursing students. 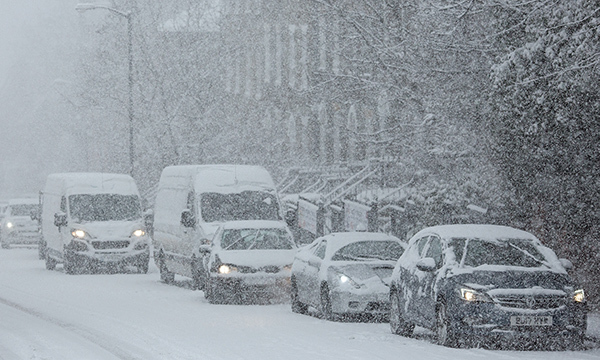 Nurses around the UK battle snow and freezing conditions to reach patients and their workplaces as the country begins the month in the grip of the storm dubbed the ‘beast from the east’. The Prince of Wales praises the ‘endless care and devotion’ of nurses at a special reception for the profession at Buckingham Palace. A £4.2 billion pay deal for the NHS, agreed between unions, government and employers and offering a pay rise of at least 6.5% over three years elicits mixed reactions from nurses. Some argue the deal does not benefit all equally, given that some staff will receive uplifts of 9-29%, depending on where they sit in their pay bands. A 29% increase in the number of EU nurses and midwives leaving the UK register compared with the same time the previous year leads the RCN to blame the government for what it describes as a ‘botched Brexit’. 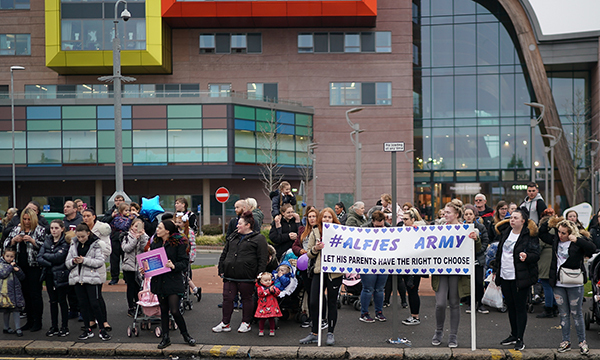 Nurses and other staff at Alder Hey Children’s Hospital in Liverpool are targeted by protesters opposed to the withdrawal of life support for 23-month-old Alfie Evans, who is terminally ill, after his case makes national media headlines. 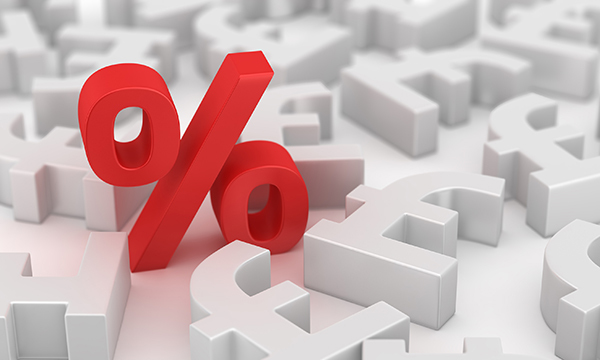 The Nursing and Midwifery Council confirms it is freezing its annual registration renewal fee at £120, despite anticipating it will lose £1.4 million this year – the equivalent of 11,666 registrants’ fees – due to shrinking numbers on the register. England’s chief nurse Jane Cummings announces she will step down from her post at the end of 2018, after six years in the job. At RCN congress in Belfast, the college demands that safe staffing legislation be enacted across the UK after a report shows patients are in danger and nurses are at breaking point. 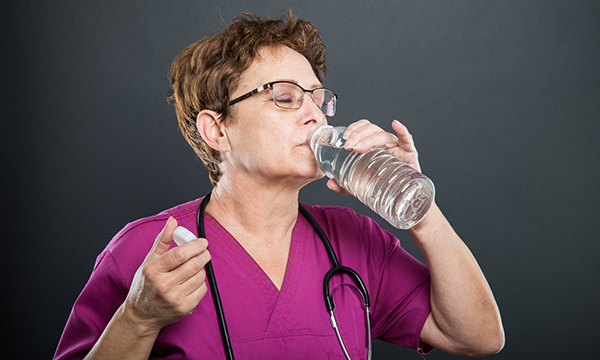 Meanwhile, a Nursing Standard survey reveals that nurses are facing appalling pressures at work, regularly going without food or water, missing breaks and working in chronically understaffed conditions. 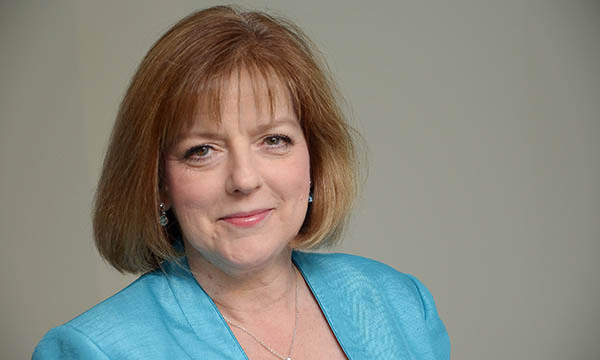 NMC chief executive Jackie Smith announces her resignation a day before before publication of a review of the organisation’s handling of midwifery failures at University Hospitals of Morecambe Bay NHS Foundation Trust. The NHS pay deal is formally backed by the RCN and 11 other unions, following a six-week ballot of members. 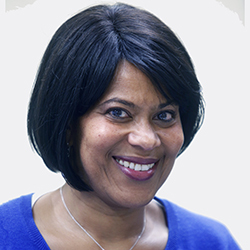 In the Queen’s birthday honours, NHS England’s director of the Workforce Race Equality Standard Yvonne Coghill is made a CBE for her services to racial equality in the NHS. Nurses’ achievements are at the forefront of the NHS England Windrush awards in Manchester. The event marks the 70th anniversary of the arrival of the Empire Windrush ship, which brought workers from Caribbean countries to the UK, as well as the start of the NHS. A review into hundreds of untimely deaths at Gosport War Memorial Hospital in Hampshire finds that night duty nurses were stifled when they spoke up. 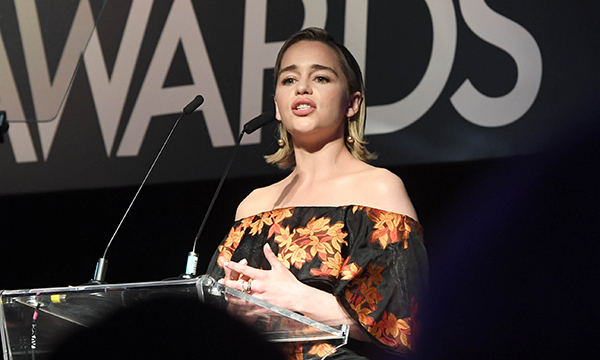 Game of Thrones actor and RCN ambassador Emilia Clarke tells nurses at the RCNi Nurse Awards 2018 that ‘now more than ever we must value nursing’, having been inspired by the care her father received before his death. 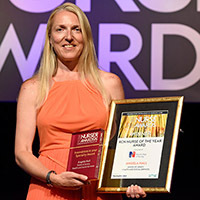 She presents the accolade of RCN Nurse of the Year 2018 to arrhythmia nurse specialist Angela Hall. 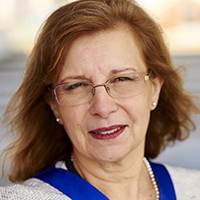 After detail emerges suggesting the NHS pay deal amounts to less than nurses were promised, RCN general secretary Janet Davies issues an apology to members and pledges an independent review. 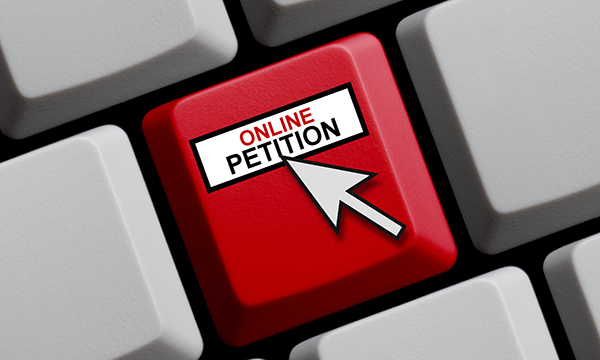 A petition calling for an emergency general meeting of the RCN secures 1,220 signatures from members and is submitted to the college. A multi-million pound campaign to recruit more nurses in England begins in the week the NHS celebrates its 70th anniversary. New figures show 5,000 fewer students applied for nursing courses this year than in 2017, with the RCN blaming the removal of the bursary. A nurse killed while trying to help people during the London Bridge terror attack in 2017 is posthumously awarded the Queen’s Commendation for Bravery. Jeremy Hunt's six-year tenure as health secretary comes to an end as he moves to the Foreign Office and Matt Hancock takes responsibility for health and social care. RCN general secretary Janet Davies announces she is stepping down. The move follows criticism of the college’s handling of the NHS pay deal that members voted to accept in June. The NMC says it has no plans to review the case of nurse Isabel Amaro, struck off following the death of six-year-old Jack Adcock, despite the fact that Hadiza Bawa-Garba, the junior doctor struck off over the same case, has been allowed to return to practice. call for RCN council to stand down. RCN council loses a vote of no confidence at an extraordinary general meeting in Birmingham over the union’s handling of the NHS pay deal in England – the motion calls for the council to stand down. Nursing regulator the NMC pledges to take into account the context in which nurses make decisions when errors occur, as part an overhaul of its Fitness to Practise processes, starting this month. 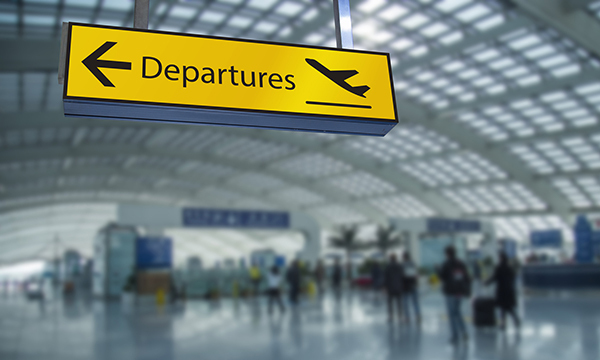 A Nursing Standard investigation suggests high nursing student attrition rates in most parts of the UK, with an average of one in four dropping out of preregistration courses. Members of the RCN’s ruling council announce their resignations following the vote of no confidence in the handling of the pay deal in England, and say a new line-up will be in place by January 2019. Prospective nursing students – in particular mature ones – should have access to hardship funds, a new Health Education England report into attrition rates recommends. The Reducing Attrition and Improving Retention (RePAIR) project found financial problems were the top reason nursing students considered leaving courses. A Commons committee says the flu jab should be mandatory for certain nurses who work with patients who are at risk of serious illness from flu. The health and social care secretary announces that the NHS is to adopt a ‘zero tolerance’ approach to violence against its staff and prosecute offenders quickly. 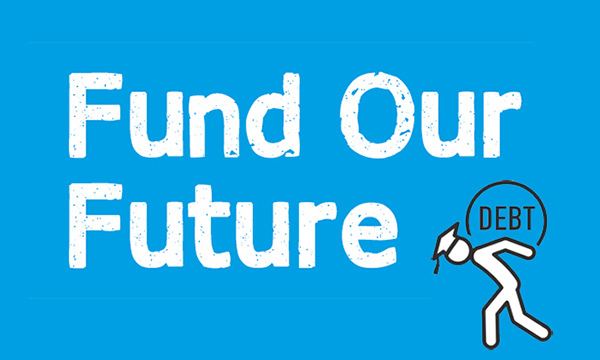 The RCN launches the Fund Our Future campaign, calling for £1 billion a year to be returned to nursing education funding in England. The campaign calls on students to lobby their MPs about the difficulties they have faced since the bursary was axed in England in 2017. A study commissioned by the Cavendish Coalition, a 36-strong group of health and social care organisations, predicts that England could be short 51,000 nurses by the end of the Brexit transition period in 2021. The RCN asks nurses in Northern Ireland if they want to be balloted on taking industrial action over the absence of any pay award in the country. Nursing staff in England, Scotland and Wales have already received their pay awards for the year, backdated to April. 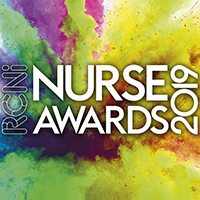 The annual search for nurses who represent the best of the profession begins with the launch of the RCNi Nurse Awards 2019. The deadline for entries is 1 February 2019, and the awards ceremony will take place in London on 3 July 2019. 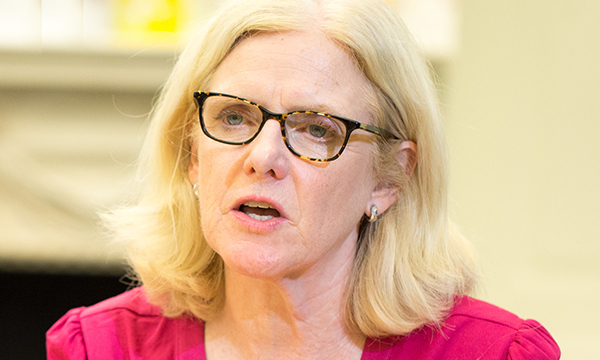 NHS England’s chief nurse Jane Cummings leaves post after six years in the job. Professor Cummings says: ‘It has been an honour and privilege to be the professional lead for over 500,000 nurses and midwives who make an incredible difference to people when they need it most’. A NHS Improvement consultation on draft guidance on safe staffing for nursing associates closes. The NHS long-term plan was due to be published, outlining the direction of the health service for the next ten years. It now looks to be delayed until the new year.